Mussels and fries is listed among the appetizers, but is a hearty enough portion to serve as a main, which is what Mrs. F did. They use nice Penn Cove mussels, steamed in witte beer that's spiked with orange, chiles and fennel pollen, with a ramekin of aioli alongside for dipping either the mollusks or the accompanying fries. The fries were skinnier, and floppier, than the typical Belgian-style double-cooked fries. In what would seem like an uncharacteristic instance of presentation trumping taste, the fries were served stuffed into a pint glass, resulting in the ones buried deeper within the glass steaming from their heat and getting soggy. Where most restaurant menus have their most alluring items (to me, anyway) in the appetizers, there was plenty of temptation among the entrées at The Ravenous Pig. 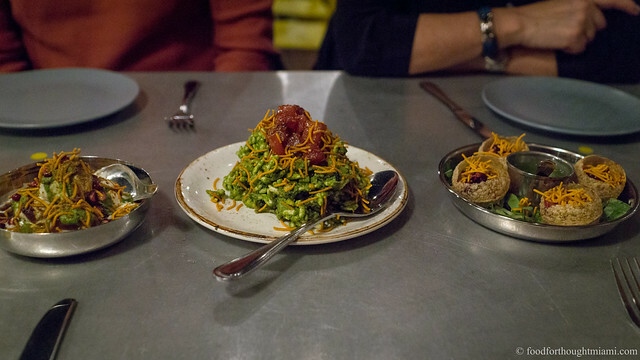 I bypassed a smoked sturgeon with an oxtail marmalade and brown butter spaetzle, a cocoa nib crusted venison, and a berkshire pork porterhouse with pickled mustard seed butter, instead opting for pastrami spiced veal cheeks. I was not disappointed. The veal cheeks had been rubbed with pepper, coriander and other spices, then cooked for a long period sous vide, and the technique was perfectly executed: the meat was tender and silky, all of the collagen completely broken down, yet still a pink medium temperature within, and not just breaking down into brown, ropy strands. The spice rub cut through some of the richness of the meat, with further contrasting notes coming from a radicchio and red onion agrodolce and a sweet-sour pear mostardo. A creamy, chewy farro risotto rounded things out. Frod Jr.'s steak frites disappeared before I could try it, though the flat-iron looked perfectly cooked and came with a nice house-made steak sauce. Little Miss F's guinea hen, with the breast stuffed with mushrooms and served over a rich roasted garlic polenta, and crowned with a shaving of Oregon black truffles, was the only dish that didn't really excite. Those truffles sadly lost their aroma somewhere along the way across the country and imparted little to the dish, which had no other real bold flavors to make up for the shortfall. There is, as there should be for a place calling itself a gastropub, a good selection of beers: not encyclopedic, but rather a curated list of about 8 beers on tap plus a few more in bottles. Those on tap can be had by the pint ($6) or half pint ($3). The Ommegang Belgian style ale was just about a perfect match for those spicy, rich veal cheeks. The wine list follows a similar pattern, with a short list of about 4-5 choices in each major genre with prices orbiting around $50, as well as a very nicely assembled selection of higher-end stuff that is still, relatively speaking, very reasonably priced. If the kids hadn't done the "Dessert Tour of Epcot" earlier in the day (the lefse rolled with butter and sugar at the Norway pavillion really are not bad at all; the funnel cake outside the American Adventure pavillion was followed 15 minutes later by regret, as funnel cake invariably is), we would have tried desserts. 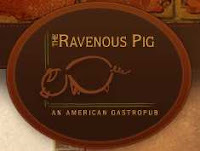 The food at The Ravenous Pig is honest and unfussified, but still demonstrates a use of top-notch ingredients and rock-solid technique. If I were in Orlando or the Ravenous Pig were in Miami, this is a place where I would surely be a regular. Indeed, it's the kind of place I'd love to have in Miami. I've heard so many great things about this place! It's on my list of restaurants for my next trip to Orlando. This is one of my favorite restaurants. Everytime we go to Orlando to visit my parents, I try to squeeze in at least one visit. They do a great lunch as well. excellent restaurant and great review. I know a few locals are nearly regulars there, making the drive whenever they are near. I don't know if they still do, but they used to have either a weekly or monthly whole pig cookout.